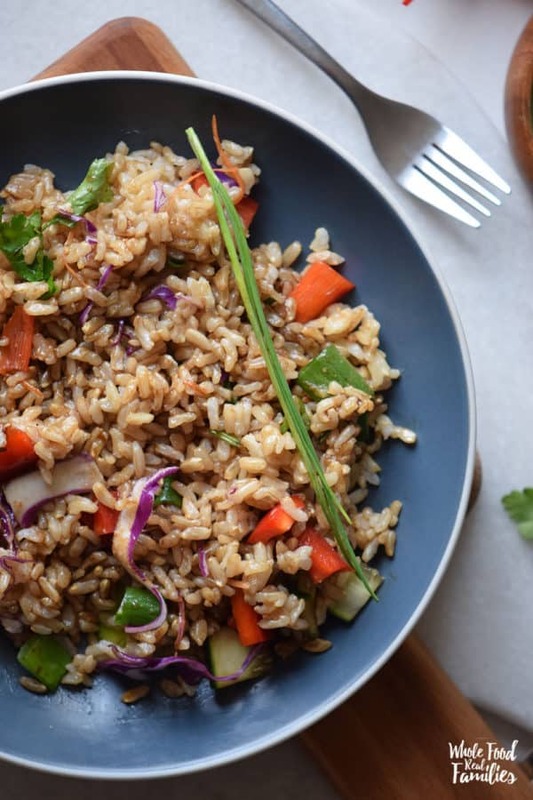 Brown Rice Stir Fry makes leftover rice a goal, not an accident. Delicious and full of veggies, make it a filling lunch, a light dinner or top it with last night’s protein for a meaty, quick meal. We love stir fry – so anytime there is a reason to make brown rice, I always make enough for more than one meal. Because leftover brown rice makes fabulous Brown Rice Stir Fry. This recipe is very flexible so change out the vegetables if you need to! It is beautiful and colorful on the table, which I love. It has gotten more than one comment from guests who have no idea how simple it is to make. Or that this recipe is a great way to use up the bits of vegetables hanging around my refrigerator. Most of the time, this dish serves as a side at our house – a tasty way to get my kids to eat their vegetables. But if you need a main dish, top it with beef, chicken, shrimp or tofu. I have even topped it with pulled pork and it has always been delicious! Are you looking for other ways to make brown rice interesting? Check out this Herbed Brown Rice. 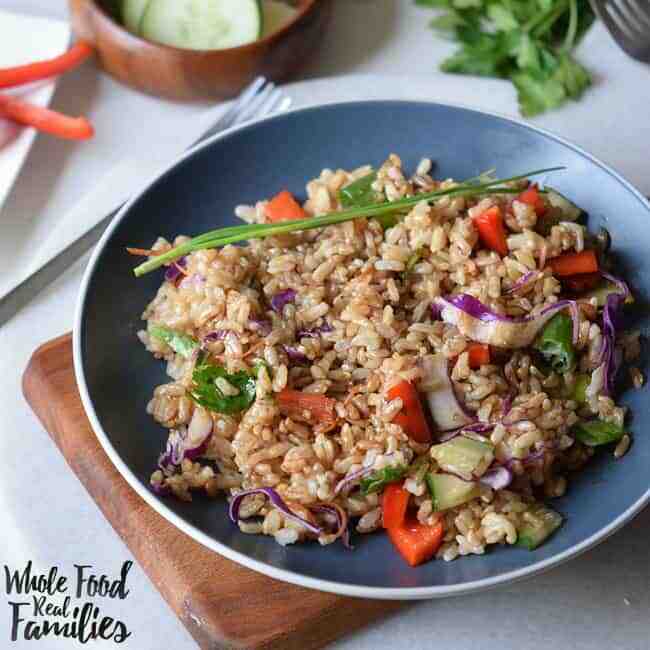 It is so simple and delicious – and works great in this Brown Rice Stir Fry too! I also love this Healthy Vegetable Fried Rice recipe! Place the rice and all vegetables in the pan. Stir fry over medium heat for 2 – 3 minutes. Add the soy sauce and stir for 2 more minutes. Tip: Add some grated ginger to spice things up! We love rice in our home, we eat it all the time. Thanks for sharing your recipe i will need to try it out. You are welcome Diana! Thanks for stopping by! Nice dish, my aunt never eat any rice but brown rice only. I will share this to her so she can have a nice recipe for it. Thanks Nicole. I hope she enjoys it! This recipe sure looks good! We usually make our stir fry rice with white long grain rice. Would be a fun change to try making it with brown rice! Hi Marielle! Let me know what you think! I enjoy my version of brown rice stir fry. I’m looking forward to trying your variation. I’ll let you know which one wins over my family. So delicious, right?! I hope you enjoy it. I need to give this recipe a try it sounds great. Thank you so much! I love Food Hunter’s Guide. And love seeing you here. Ahh! The ultimate in a delicious — and quick meal! Love this! So many nights I’m wondering what to make: stir fry to the rescue! I love it so much because it is easy to prep, cooks fast, and makes few dishes. Perfect for weeknights! Such a lovely versatile dish. It’s a great way to reduce food waste. Pinning! My whole family loves stir fry!! This looks delicious!! We do too. And I love how fast it cooks! Perfect Weeknight Meal! I love all the pretty veggies in there! I really like stir fry recipes because they are so easy to make, especially during busy nights. This is such a nice recipe, it’s definitely a keeper! 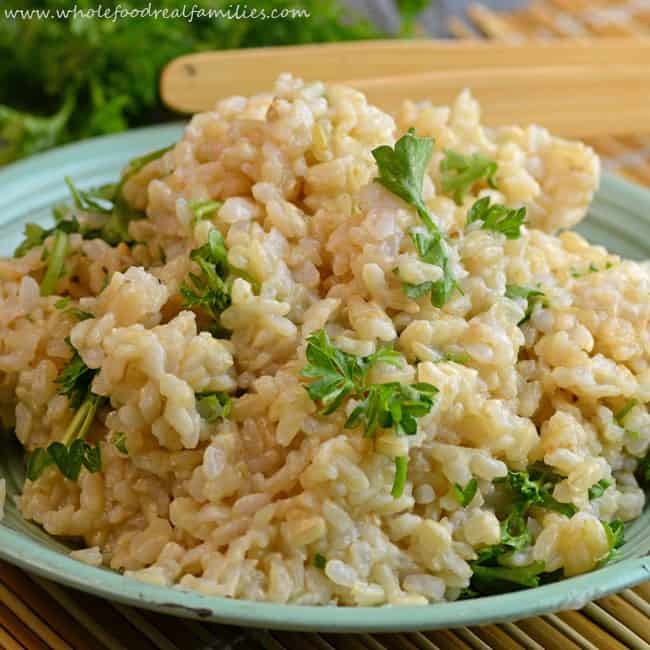 I love brown rice and how to create delish meals with it is can be very fun. Add nutritous colors with it and your good to go. It’s kind of a hit or miss for me. Sometimes I like it and sometimes, I don’t. I do know that it is healthy though. Haven’t tried having fried rice this way. Left over rice in our house gets to be recycled into garlic fried rice that we all love. I think that herbed brown rice would be nice. I’m trying out your recipe too. Thanks. Something i would love to serve to my boys as sometimes they are as if having some rice fatigue. With this, we could have a rice more flavorful and colorful. I do eat a lot of rice, but not enough brown rice. I really ought to. Lovely ‘goal’ dish. OMG looks so amazing and thxs I will be making this dish very soon! This sounds like a delicious meal, especially with a protein added. I would fix this exactly like you have the recipe and I think my family would love it.